Finally, it's out! The main piece of work to come out of my two-year period as Research Associate at Lancaster University is published today in PLoS Genetics. The article reports a study in Lancashire, England, of the bacterium Campylobacter jejuni, the primary cause of bacterial gastro-enteritis in developed countries. 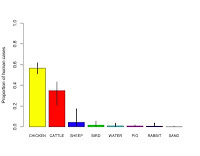 We inferred the source of infection in 1,200 patients by comparing the DNA sequences of C. jejuni taken from those patients to 1,100 taken from different animal species and the environment. The result: livestock are the source of infection in 97% of cases. In addition to preparing the figures, approving final drafts, and producing a press release in conjunction with the PLoS Genetics and university press offices, I have spent much of my time over the last three weeks revising a companion paper on the evolution of C. jejuni. On Friday that was resubmitted to Molecular Biology and Evolution, and should it be accepted, will draw a line under my Lancaster projects. Well done Danny! good luck with MBE.